Brownsea Island was the site of the first Boy Scout camp and ‘Be Prepared’ is the Scouts motto but being prepared was something that I failed to be on our visit to Brownsea this weekend. Stour Ringing Group has had permission to ring on the lagoon for many years. I haven’t been on many of these outings, mainly because it takes up most of the weekend and the numbers who can attend is restricted.. Catching waders in nets can only be performed at night, is best when a high tide occurs after dark and for obvious reasons cannot be carried out in the breeding season. I left it late leaving for the 1615 rendezvous at Sandbanks (mainly because I was trying to get the previous blog post uploaded) and ended up rushing. On arrival at the island I found I had left the memory card of my camera in the PC and my water proof coat in the boot of the car. Unlike the Boy Scouts I was far from prepared! We set up the nets before dark but I was unused to walking in my new chest waders and soon over-balanced in the sticky mud. Without a waterproof top I got soaked and as the nice warm day had ended, rather cold. Back at the Villa, I tried to get cleaned up and dried out but later needed to borrow a coat from Bob as a cold wind had got up. It was almost dark by the time the nets were up and I could get back and get cleaned up. Photo by Terry Elborne. Enough about my comfort, how did the ringing go? Well the last visit trapped over 90 birds but we only caught six, 2 Black-tailed Godwits, 1 Bar-tailed Godwits, 2 Oystercatchers and a Dunlin. It wasn’t that bad however, all four species were ones I haven’t seen in the hand for a long time, there was time to examine them in detail and best of all, the Dunlin was a control, that is a bird previously ringed elsewhere. Compare the plainer upperparts of Bar-tailed Godwit. Bar-tailed Godwits have a slightly up-turned bill and shorter legs than Black-tailed Godwits. This bird will be heading for the Arctic tundra whilst Black-tailed breed in wet meadows in lower latitudes. We were back at the Villa by 0115 and although the others had a lie in I was up at 0600 to do some birding before we left at 0900. Great-spotted Woodpeckers were very obvious, I could hear at least five drumming from the same point and Red Squirrels abounded (for those not aware, Brownsea Island is one of very few locations where this species still exists in southern England) and about 15 were seen. I only had time for a short scan over the lagoon but 24 Knot, 3 Greenshank, 19 Avocets and an incredible 115 summer plumaged Mediterranean Gulls. The main reason for my early departure was to add Golden Pheasant to my year list. Brownsea is only one of two locations in Dorset where this introduced pheasant can be found (the other is Furzey Island, owned by BP and closed to the public) but rhododendron clearance has reduced cover for this species and it has become harder to find. After about an hour of searching I found a pair and had beautiful views. 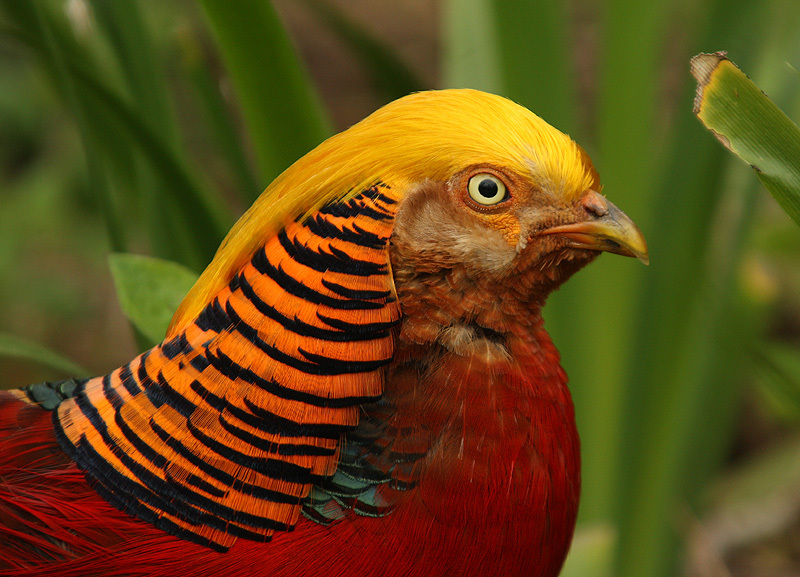 It might not be a native species, but the male Golden Pheasant is a stunning bird that it always a delight to see. Photo from the Internet. I got back to the Villa in time to be ferried to the quay for the boat to Sandbanks and home for a well-earned rest. Many thanks Terry for the photos. The boat back, Brownsea ringers: L-R Michael Gould, Bob Gifford, Sean Walls, me and Andy Welch with Terry behind the camera.